In this blog post, I’ll explain how to export Facebook birthdays. 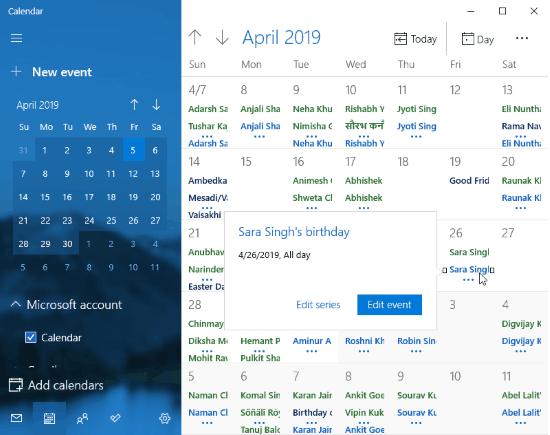 Here is the simple solution to export and add birthdays in the calendar. You can use the online service for that. 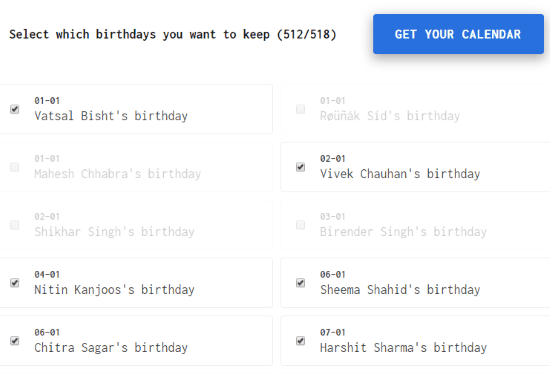 Your-Birthday-Parties.com is a free website that helps you to take out the birthday list from Facebook in your calendar. Firstly, you have to collect the birthday data from your Facebook event page. The site has a direct link as well. You can click on that and export data. The data includes all birthdays that are added in your Facebook friend list. After downloading the data, you can drag and drop the file in the interface (of the website). Doing so, the site structures the report to make a calendar. The good thing about this site is that it lets you add selective person’s birthday. Suppose your Facebook account has 500 friends and you don’t want to add their birthday in your calendar. Here, the service has an option to untick those people. This way, you can manually select your best friends, family members, etc., to keep their birthday in a calendar. Now you’re never going to skip birthdays anymore. And, you don’t have to rely on your Facebook notifications. Also, use Android apps for birthday reminders. To export Facebook birthdays, you can visit the website called Your-Birthday-Parties.com. In just a few simple steps, you can export the birthday’s list of your friends. Also, you can manually select people to export their birthdays. Let’s just know how to do that in just four steps. Step 1: The very first thing you need to do is to download a birthday list from your Facebook account. The website (Your-Birthday-Parties.com) has a direct option for that which is titled as your Facebook event page. After clicking on the link, your Facebook event page opens. Then, you can download birthday data from the bottom right. Or you can log in to your Facebook account. Then, open the section called Event. There you will find the birthday option located on the right. Clicking on the option automatically downloads the birthday list. The list contains all the friends that are added in your Facebook account. Step 2: The second step is to import the list in the interface. Now, you can drag and drop the downloaded birthday list. Once you upload the birthday list in the interface, it shows the entire birthday of all your Facebook friends. Step 3: Since it is not necessary that you want to remember everyone’s birthday. In this third step, you can keep only those birthdays that you want in your calendar. Step 4: Once you are done selecting your friends, you can click on the Get your calendar option. And then the birthday list gets downloaded in your computer. Also, it exports to your calendar automatically. There, you can edit the details if needed. Though Facebook is the only way to remember someone’s birthday as it notifies you. But in case you don’t use Facebook for a couple of days then you can miss the birthdays. Using this website, you can directly export Facebook birthdays and add the list to the default calendar. In this way, you can prevent yourself from forgetting your friend’s birthday.